"Try to grab your enemy without getting caught! " Game Goal: Control fighting monsters and robots and battle against rivals to try and catch them before they catch you. How to Play: Throw your hook to try and capture your opponent who is on the other side of the river. You can catch monsters, enhancers or money to upgrade and unlock new characters. 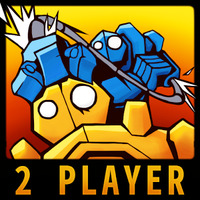 Game play: In addition to the dozens of monsters and robots you can unlock, the game allows you to battle against someone on the same phone. Controls: It's controlled by touch screen. You have to tap the screen when the arrow is pointing where you want it to go. Languages: Japanese and English interface. Do you like Blitzcrank Battle?